So one fine weekend when my husband and I were in Dubai, we decided to experience Atlantis, the Palm. Yes! Such a fun weekend activity it was, and the first thing we did there after having lunch at one of the French restaurants in the hotel called La Brasserie, was to see The Lost Chambers Aquarium. Atlantis, the Palm is a hotel resort built on an island with distinctive Arabian elements. It has more than 1500 rooms and has two wings, one called the East and other the West Tower, that are connected by the Royal Bridge Suite. Sounds huge! Isn't it? It also has a water park called Aquaventure and the very popular Nasimi Beach. Now this beach is a hot spot for concerts and they do the best fireworks on the New Year's eve. 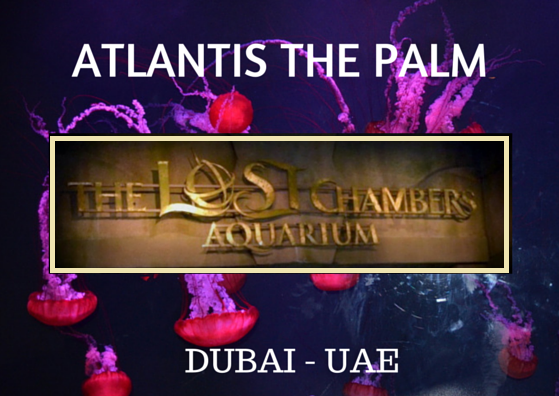 I will be sharing my experience with lots of more pictures in the next part of my stay at the Atlantis, the Palm, but this one is dedicated to The Lost Chambers Aquarium, which is also inside the hotel. 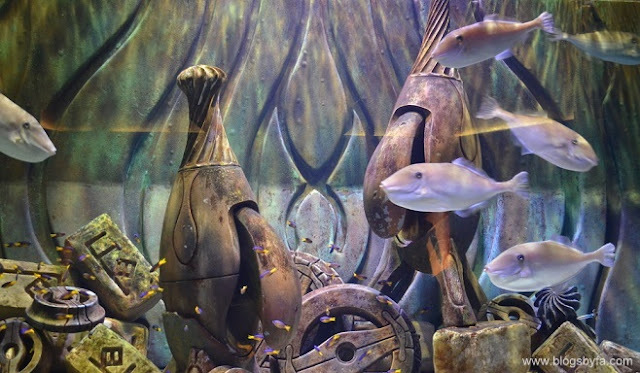 The Lost Chambers Aquarium is the home to 65,000 marine animals, has 20 aquatic exhibits in touch tanks and The Ambassador Lagoon, seeing which, was a remarkable experience. Since we had already paid for staying at the hotel, our entry inside the aquarium was complimentary. The general entry ticket for adults who are day visitors costs AED 100/19.35 British Pounds but they offer special rates for UAE residents if they show the proof of residence. If you wish to go there just to see the aquarium, you can see the ticket prices here. I have often seen people coming there and taking their photos outside the aquarium. You can also do that, and for that you don't need to buy the ticket, as its totally free, but the ticket is for sale if you wish to go inside the aquarium. Besides viewing the fish tanks, the aquarium also has many other things to offer but at an added cost. You can opt for ray feeding, snorkelling, shark safari, dive explorer, dive discovery and shark night and predator dive too. We wanted to keep it simple and short as there were many other things to do as well so decided not to go for any further activities, and also because they were charged. So, just viewed all the fish tanks in detail and did lots of photography. Sadly, I don't even remember those details now, there was so much to learn about the fish there! Enjoy some of the photos of the fish tanks below. Looks amazing! You captured great photos. That is a huge place I must say. Wonderful experience. Thanks David! Yes, it is huge indeed. Had a great experience. Those photos are so mesmerising! You gotta post more from Atlantis. Or don`t, I don`t want to know, there might be a chance I`ll go there sometime. Hehe :) I will be posting more soon. Yes, you must definitely add it to your travel list. If I ever get an opportunity to visit Dubai, I will be sure to stay at the Atlantis, the Palm hotel. Thank you for sharing your wonderful experience and beautiful photographs! You must stay at Atlantis at least for one day. It is costly though. Great photos and fabulous colours from these amazing fish species. We have an aquarium in the Irish town called Bray where I live on the east coast of Ireland but it is a much more modest version of this one. Thanks for sharing that information. I would love to see that when I visit Ireland. I love aquariums, they give such a romantic feel. Also, I love the idea of staying at hotel over the weekend. I have always loved aquariums but the cleaning part was a major setback. Although I did have a small fish pot at home before I got married. Wow! My husband is in the process of setting up his salt water aquarium in our home. Needless to say, any time we visit a new city, we always visit the aquarium! This one looks incredible! O wow! That's really cool. I would love to see the pictures of your salt water aquarium. 65,000 marine species that is incredible! I have always found aquariums fascinating and it excites me how little we still know about underwater life. Oh well! There are so many species. 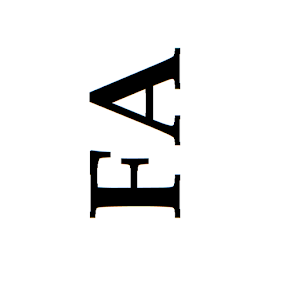 I had started reading about them and got confused so I just decided to close the booklet. woww it's something I'm crazy about. You have taken beautiful pics and palm of Dubai is simply enchanting. Have you been to the Palm? Thank you for your comment. Ah! I miss being in Dubai so much. This is not just a normal aquarium. It is HUGE! You must see it. The aquarium interior and design is cool! Mysterius, and grand at the same time. 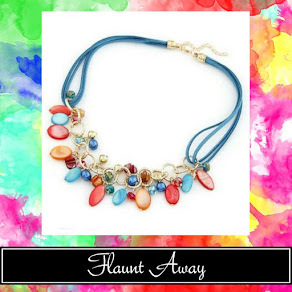 It gives the effect of a lost city. Your photos are stunning! Yes, you got it right. That was actually the idea behind it. 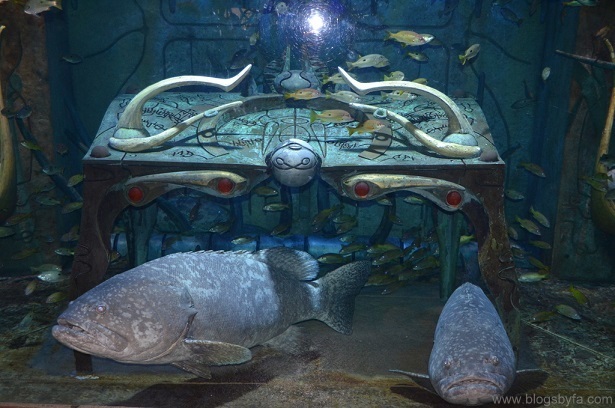 I think we preferred the Dubai mall aquarium to lost chambers! But both were good. This has reminded me that I must get on with my Dubai posts! Its been months! Haha would love to read your posts about Dubai. I have been there. I particularly like the open Cray fish tank. I wonder, whether it is safe to touch them? Nice snaps. It reminds me of the aquarium. I'm absolutely amazed i love underwater life always fascinated and how little we know about it, even though is 21st century. Amazing Pictures. So true! There is so much to learn about the underwater life. WOW! Fatima, great place but why they have named it the Lost Chambers reminds me of the the Harry Potter? well, I am interested in the various diving offers. You should definitely go there when you go to Dubai next time. Love to your baby. I love visiting humongous aquariums and this one looks amazing. We've stayed at Atlantis in the Bahamas and visited S.E.A. Aquarium, Resort World at Sentosa in Singapore. I have to say my favourite one is Atlantis Bahamas. I've always wanted to visit Dubai, I will have to definitely add this to my list now that I know they have a huge aquarium. O wow! I would love to visit the Bahamas. I've always want to go there and will do one day I'm sure but from the photos it looks fab! Hey hi! Thanks for stopping by. Wow your photos look gorgeous. I'd love to visit this place one day. Definitely a bucket list item now. This looks AMAZING! At first I scrolled down quickly and I thought it was all CGI images. I hope I can see it for real one day! Haha, no! These are real images captured by me. Haha why do you think so? If you see the ticket price in pounds, it doesn't seem much. You caught amazing photos. They are so beautiful. I love aquariums. I'll surely visit there if I get an opportunity to visit Dubai. Yes! Lots more than just the glossy buildings. Great photos! I never get good images at the aquarium for some reason. 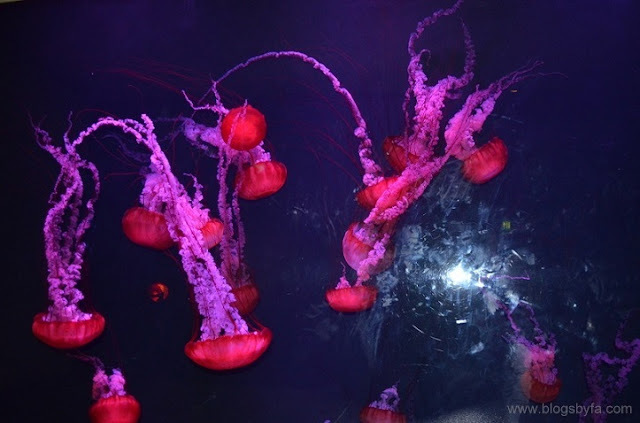 Never been to Lost Chambers Aquarium and in fact never heard about it either but your images are super cool..
Looks amazing, I love aquariums!Great post and photos. I really like how they decorate their aquariums. This sounds like such a cool place! I've heard a lot of The palm on Dubai. My sister in law works in Dubai and she's gone there a couple of times. Wish I could go there sometime. Snorkelling would be fun. You can go there during the day even if you don't wish to stay there for the night. 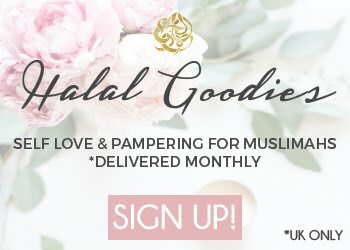 Mashaa Allah, another blogpost I read about the beauty of Dubai. I've been planning to visit Dubai with the family but some matters always come in. I'd love to visit this in shaa Allah, soon. Underwater life is sooo beautiful and amazing. By the way, Lovely photos you have here! Thanks a lot. I hope you get to visit Dubai soon. lovely pictures! I have been to dubai a couple of times! But always its been a short visit and never made to atlantis! My daughter would absolutely love this! will take her next time! You must definitely go to the Atlantis next time. You will love it. Lovely clicks. 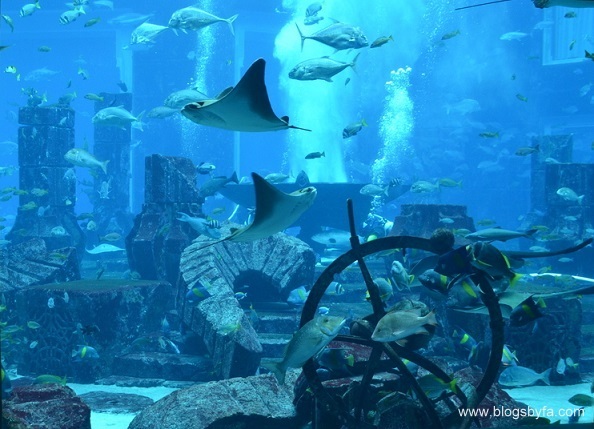 Have been to Atlantis once.Being in UAE its easy to visit attractions like these. But Dubai being the city of the rich and is full of luxuries not all can afford to experience these man made wonders. That's true but Dubai has so many other things to offer that can be done within a budget too. 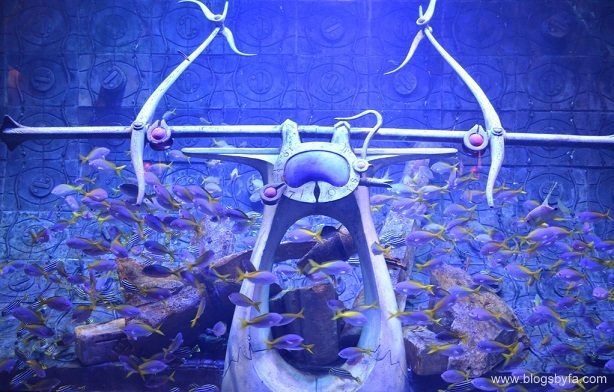 The Lost Chambers Aquarium looks really cool. I hope I can go there since my older sister lives near Dubai. Great! Apart from this aquarium what are the other attraction of this place?